Visit a real working Asparagus Farm for a fun filled family friendly day packed with memorable experiences. Savor the flavor of how incredibly sweet & tender locally grown fresh asparagus tastes at the field & prepared by local chef. Experience first hand our asparagus story on our fully narrated wagon ride to the fields & witness first hand harvesting in action. Greetings by giant Aspara-Gussy. 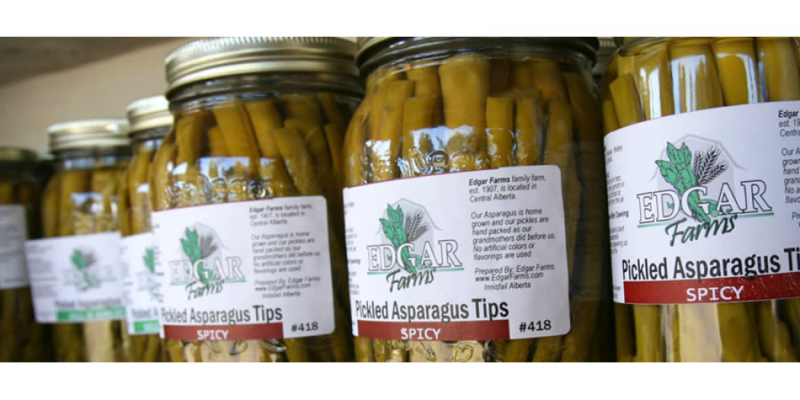 Shop at Edgar Farms Country Store for freshly picked asparagus and other produce, handmade preserves, both sweet & savory pies, ferments, our all natural beef & more (be sure to bring a cooler) Don’t miss our Artisan market Village for shopping galore. The children will have a ball visiting our farm animals, playing in our pea pit, building our aspara-gussy giant puzzle, milk a cow, rock painting, plant some pea shoots, spin the wheel & try their luck at the Asparagus Harvest Game & many other fun activities & lots more! Edgar Farms is located 10 km. SW of Innisfail on a paved road.